The National Initiative for Building Community Trust and Justice is designed to improve relationships and increase trust between minority communities and the criminal justice system. 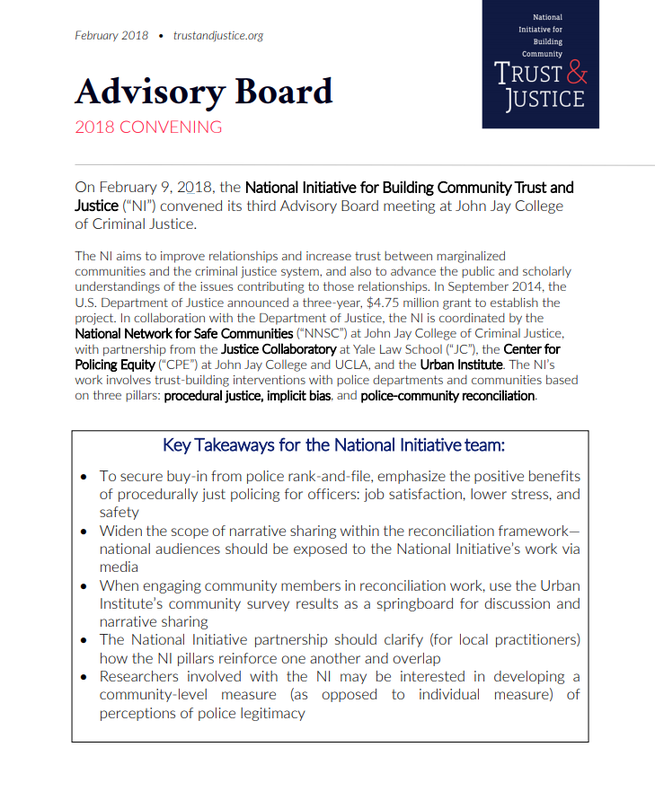 On February 9, 2018, the National Initiative for Building Community Trust and Justice convened its third Advisory Board meeting at John Jay College of Criminal Justice. The discussion included presentations from all NI partners (the Justice Collaboratory, the Urban Institute, the Center for Policing Equity, and the National Network for Safe Communities), and Advisory Board members used this opportunity to outline affirmative and complementary visions of a reformed criminal justice system. To learn more about the progress of the National Initiative, and to read these key insights, please visit this link. For more information about technical assistance through the National Initiative, please submit requests to the Office of Justice (OJP) Programs Diagnostic Center. The OJP Diagnostic Center is a technical assistance resource designed to help state, city, county and tribal policymakers and community leaders use data to make decisions about criminal justice programming. The Diagnostic Center invests in what works by bridging the gap between data and criminal justice policy at the state, local and tribal levels. Diagnostic Center engagements are intended to build community capacity to use data to make short-and long-term evidence-based decisions about criminal justice and public safety.